Coba is as enigmatic as Stonehenge. Its name, "water stirring in the wind" , only adds to the mystery, plus the fact that the names of its kings have been blurred out on purpose. Whoever did that, we'll never know. Still largely covered by vegetation, research and mapping projects have shown the remains cover an area of at least 70 square km. This makes it one of the largest cities of the Ancient Mayan culture. What you can see today is actually only the core area. It's way closer to the Mayan Riviera , at about 1 1/2 hours drive from Playa del Carmen. A modern road now connects the 44 kilometers between Tulum and Coba. Somewhere in the near future a new airport will facilitate the arrival of thousands of tourists. Land prices have risen accordingly. Here's an interesting detail: watch out for a sign with the name "cenote Carwash" on your way. Imagine this: years ago, long before the road was paved, the cenote actually served a carwash facility for the dust-covered vehicles on their way back to Cancun! Next you'll pass throught several communities on their way to civilization with souvenir shops, small hostals and the unavoidable speeddbumpers. For lunch I recommend Las CabaÃ±as at km. 26. It's a friendly family run business. The food is simple but tasteful. And doÃ±a Chepis (short for Josefa) keeps her place spick & span. For the adventurous, the main temple can still be climbed. 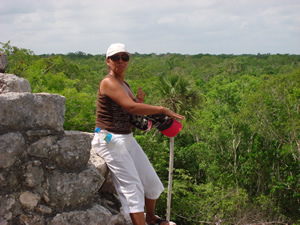 At 42 m this is the heighest Mayan temple on Yucatan's east coast. Its name, Nohoch Mul, means Great Hill or Mountain. Mayan pyramids are, in essence, references to what they thought of as a primordial mountain. It's about a 2 km hike to the main temple. If that seems too much to you or you have brought your children along you can rent what we call a "Mayan limousine". This is an on-site tricycle taxi service. The taxi seats two adults and two or three small children. Cost is US 16* for the full two hours or 65 pesos* just to take you back from the pyramid to the exit. You can easily combine your visit with Tulum, or Muyil if you're looking for a less crowded place. As an alternative you can explore the recently discovered cenotes just a few kilometers away. 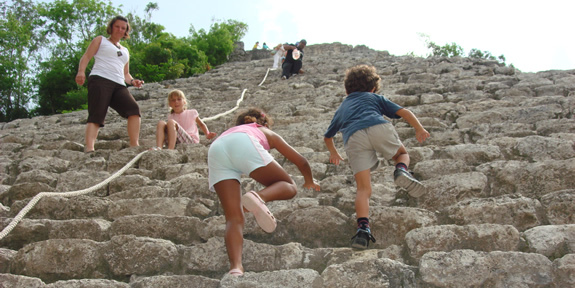 Very popular nowadays is the Coba - Mayan Encounter. 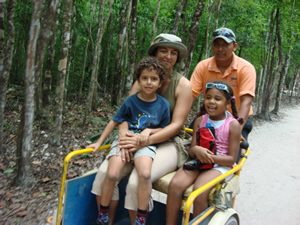 This tour includes a zip line and cenote swimming and a visit to a Mayan community. Before you start your exploration, let me just say a few words of caution, in case you want to adjust your expectations a bit. The goal for the Coba project was to stop its decay and leave it at that, rather than to impose our truth about how it must have been. I won't deny that the experts today have a high degree of knowledge about how these cities looked like, but on the other hand we cannot go back to the sixth century and have a look around, can we? There's always room for speculation to some degree. That's why today modern interference is only accepted to consolidate the structure and to keep it from falling down. There's no intention whatsoever to completely restore the buildings. For this very reason Chichen Itza to many visitors comes over as more attractive to the eye. Chichen presents a range of decorative elements like the masks of the Rain God, Rattle Snake pillars and images of Warriors and Ball Players. The grounds are well groomed and the pyramid with its many calendrical elements is a Mexican icon. Coba on the other hand is rustic and has none of these things. Sure, the temples and palaces were once covered with stucco and painted in bright colors. But now the ancient ceremonial center is a mere skeleton. The stucco and the paintings, it's all gone. But in the 7th century, AD, the kings and nobles of Coba were depicted in plaster reliefs on the facades, more or less in the way that you can still see them in Palenque. We know that because pieces of the original decoration have been found. But there's either too little left or the pieces have been removed, legally or illegally, and are hidden in many collections somewhere around the world. Just think about it, Coba used to be so far out in the jungle and nobody really cared. It was easy to send in a team in a helicopter, split a royal stela into smaller cuts with a chain saw and sell it to the highest bidder. And even the Maya themselves have done their job in ransacking the place. For fourteen centuries thousands of people were born, lived their lives and died in the city-state of Coba, before it was absorbed by the Yucatan jungle. When I lined out the various periods of development in my article about the ancient Mayan culture, I explained that the overall chronology is case-specific an may vary from place to place. As for Coba, the Pre-classic was actually quite short, starting from the beginning of our era until about 400, AD. The presence of five fresh water lagoons to support life was no doubt the reason the first settlers were attracted here in the first place. From this early period there is no proof of any construction. People lived in thatched huts around the shallow lakes, in the midst of their maize fields or milpas, much like the Maya of today. The community thrives, and at some point a centralized power emerges and starts to control the surrounding villages. This is where Coba enters the Classic. Between 600 and 800, AD, a network of elevated roads or Sac-be connects the important buildings and different zones of the area. There's lots of building activity and the ceremonial center holds important temples and an acropolis. Kings and nobles are immortalized on over 40 sculptured stone slabs or stelae. Unfortunately all their names but one where later erased on purpose. Even the name of the original kingdom ruled by Coba is lost in time. Late Classic is between 800 and 1100, AD with even more impressive buildings and longer sac-be for regional connections. While most of the sac-be are only a few meters wide and up to 700 meters long to provide for local communication, the one to Ixil is 19 kilometers in lenght and Sac-be 1 totals almost 100 kilometers. It ends at short distance from Chichen Itza in a place called Yaxunha, an important site before the arrival of the Itza. On the Caribbean coast both Xel-Ha (now a theme park) and Muyil served as access ports. With this infrastructural system in place Coba gains control over the commercial routes between the east coast and central-north Yucatan. The question is wether the Maya built their road system for mere transportational purposes or did they have another function? Research shows most of them were probably ceremonial in nature, since they covered very short distances. The two long ones I'm talking about here are exceptional and late additions. After 1100, AD Coba is abandoned.by its inhabitants. In fact, the last king was already gone by 800, AD. There may be power struggles among noble families, and by that time the Itza were gradually taking over the interior of Yucatan. However building activity doesn't stop alltogether. Post-Classic additions in Coba include so-called East-Coast-style buildings who's main characteristic is that they are very small and show poor craftsmanship. 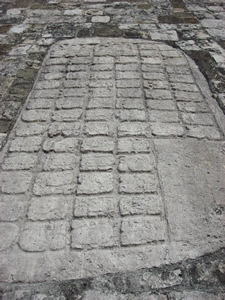 The image of a deity in a descending position is another Caribbean-style feature. You'll encounter the same figure in Tulum. The two pyramids of Coba are certainly very impressive structures. From the top of Nohoch Mul you'll have a stunning view for miles around. This could also mean that there was a strategical gain involved. Despite their height, though, these are late superstructures built on earlier ones. While these older buildings may have been less mind-blowing, they still made for a more powerful and dominant city than their later cover-ups. *Prices change, and in Mexico they do that sometimes without any warning upfront, so please don't hold that against me!